These Russian reconnaissance aircraft could map a country the size of Pakistan in single-digit missions. Details of the February 27 dogfight over the LoC are slowly trickling in, revealing interesting aspects of the multi-aircraft encounter. According to a communique issued by the Indian Air Force, the Pakistani F-16s launched four-five air-to-air missiles at the Indian formation from a distance of 40-50 km. All the missiles, most likely AIM-120s, missed their intended targets and in fact one of them was shot down by an IAF Sukhoi Su-30MKI air dominance fighter. The F-16s, being no match for the super-maneuverable Sukhois, hightailed it to Pakistan. In the history of air combat the rarest kill is an air-to-air missile kill, so the failure of the missile barrage by the F-16s isn't such a big deal. However, if the report of the downing of an air-to-air missile by a Sukhoi is true, it is a truly astounding event because that's like hitting a bullet with a bullet. People who question the IAF's version of events don't realise that the service never exaggerates its kills nor hides losses. This is because it needs to acquire a true picture of its capabilities - and that of its adversaries - and the best way to lose the next war is to get those strike rates wrong. For instance, for more than 25 years beginning in 1981 the IAF made frequent and regular over-flights over Pakistan, but has never divulged details of those missions. The aircraft used was the reconnaissance (spying) version of the world's fastest fighter ever - the Russian MiG-25 (NATO codename: Foxbat). The Pakistani military and political leadership knew about these over-flights but kept quiet because they didn't want to let their people know the Pakistan Air Force was powerless to intercept it. The MiG-25s flew at speeds of Mach 2.8 or around 3,500 kmph at heights between 65,000 and 85,000 ft while the much slower F-16s (maximum speed Mach 1.9) couldn't climb over 50,000 ft. There is no fighter aircraft in the Western air forces that can match the MiG-25. The Pakistani public first came to know of these humiliating over-flights in May 1997 when an IAF MiG-25R flew deep into Pakistani airspace on a reconnaissance mission, photographed sensitive defence sites and broke the sound barrier, sending a powerful sonic boom over Islamabad. Before the Pakistanis could figure out what had hit them or scramble their fighter aircraft, the intruding MiG-25 was back in Indian airspace. Details of the missions are classified, so it remains a mystery why the Indian pilot chose to reveal his presence over a heavily populated area of Pakistan. Some sources like Spyflight, a website dedicated to reconnaissance and surveillance aircraft, have speculated that the MiG-25 pilot wanted to show that the PAF was the IAF's bunny. "The aircraft entered Pakistani airspace sub-sonically (below the speed of sound) at around 65,000 ft and was undetected," says Spyflight. "Then having overflown and photographed strategic installations near the capital, Islamabad, the aircraft turned back towards India. Perhaps to rub the Pakistanis' noses in it, the Foxbat pilot decided to accelerate up to Mach 2 and dropped a large sonic boom as he exited Pakistani airspace. A number of PAF F-16As were scrambled, but had insufficient time to make an effective intercept." India denied the incident but the then Pakistani Foreign Minister Gohar Ayub Khan believed that the Foxbat photographed strategic installations near Islamabad. Air Power International says the Pakistan government considered the breaking of the sound barrier a deliberate act - to make the point that the PAF had no aircraft in its inventory which could come close to the cruising height of the MiG-25. Flying at the edge of space, the aircraft was virtually undetectable to Pakistan's radar network. Only the sonic boom and the fact that it was flying at an unusually low level allowed a Pakistani forward operating base to trace the Foxbat and scramble a couple of F-16As from Sargodha air base. Chasing the Foxbat was pointless. Sources in the PAF told Air Power International there was no need to intercept an aircraft flying at 65,000 ft as the F-16 could climb to an altitude of only 50,000 ft. If pushed to its limits, the Russian jet could climb much higher. On August 21, 1977, Russian test pilot Alexander Fedotov climbed to an altitude of 123,523 ft above the Earth. The Foxbat's speed posed a huge set of problem for any interceptor. It was capable of sustained speeds of Mach 2.5 whereas Western fighters could potentially end up with their engines irreparably damaged if they tried that stunt. The F-16's normal cruising speed is Mach 1.2 which would allow the MiG-25 to fly laps around it. Worse, as the highly experienced and well-equipped Israeli Air Force found out - while trying to intercept a Syrian MiG-25 - attacking a Foxbat head on also proved unsuccessful because the radars and guidance computers of Western air-to-air missiles couldn't cope with the MiG's tremendous closing speed and failed to achieve a lock. In this backdrop, the smaller and poorly trained PAF had no chance of intercepting the Indian Foxbats which overflew Pakistani territory with impunity. From 1981 to 2006, eight MiG-25s of the Trisonics squadron based in Bareilly, Uttar Pradesh, flew unchallenged over Pakistan (and sometimes Tibet), taking countless high definition photographs and radar images of the situation on the ground. Plus, they recorded electronic emissions from Pakistani and Chinese military communication networks. On an average they flew 10-15 missions a month. The MiG-25 was Russia's secret weapon against American bombers and therefore was not supplied to even its closest Warsaw Pact allies. However, the defection of the traitor Viktor Belenko in 1976 compromised the aircraft's secrets and it was made available for export, including to India in August 1981. 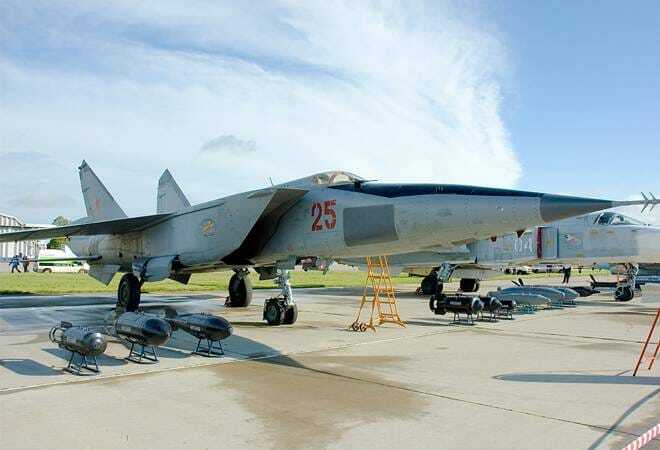 Aviation expert Shiv Aroor of LiveFist quotes former IAF chief Idris Latif: "I was shocked and delighted to learn that the Soviets were actually offering MiG-25 Foxbats to us in 1980. I phoned up Mrs (Indira) Gandhi and she told me to go ahead and make a decision...The Foxbat was the best in the world and it was made available to us." Although the photographs taken by the Trisonics remain classified, legendary aviation author Yefim Gordon offers a glimpse into the secretive world of these high-performance jets. The Foxbat had no defensive armament but relied on its maximum Mach 3 speed and its high operating ceiling to escape any attacker. In his book 'MiG-25 Foxbat, MiG-31 Foxhound: Russia's Defensive Front Line' Gordon writes: "The MiG-25RB (reconnaissance/strike version) and its versions were popular with their crews due to their exceptional performance: high speed, excellent picture quality, the ability to reconnoiter large areas in a single sortie and low vulnerability to enemy fire." The Foxbat spy plane could detect parked aircraft, trains, ships and visualise the condition of bridges and similar structures. The IAF often flew special missions for the Indian Army when it sought intelligence on Pakistani armoured assets. The picture generated by the radar was developed on the ground in a specially equipped van. Former IAF Wing Commander Alok Chauhan told LiveFist: "These aircraft can map a country the size of Pakistan in a single-digit number of missions..."
With India acquiring high resolution remote sensing satellites with the capability to read even the licence plate of a parked army truck, there was no longer a need for reconnaissance aircraft to overfly enemy territory. The MiG-25R began to look like a Cold War relic. The other reason was the issue of spare parts from Russia. IAF officers report that the Russians had closed down the plants that made Foxbat parts. They had even got rid of the blueprints. The Trisonics are gone but hopefully one day the IAF will release the stories of their missions that will detail how they ran rings around the Pakistanis. Also read: Mirage-2000 vs F-16 Falcon: Which is a better fighter jet?